Navy Coats first appeared on Chictopia's streetstyle gallery in Fall 2010 seen on Antwerpen blogger Annebeth of stylingdutchman.blogspot.com. She styled her navy coat with a heather gray sweater, silver tights, and navy shoes. Since then, Navy Coats have grown in popularity as bloggers from Los Angeles, London, and New York have discovered them. Navy Coats are generally seen in casual, chic, and classic style. Popular brands of Navy Coats are Topshop, Forever 21, vintage, H&M, and Zara. 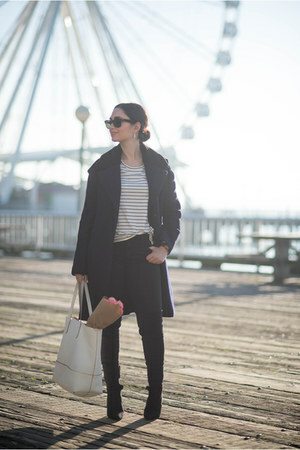 There are currently 1034 streetstyle photos of bloggers wearing Navy Coats. 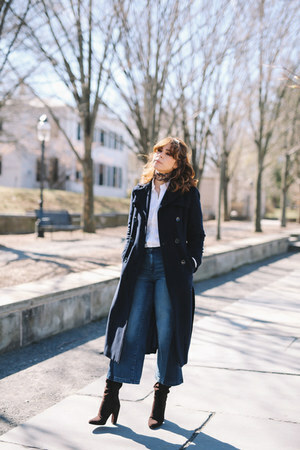 Most recently, blogger EveHearabouts of thehearabouts.com wore her navy asos coat with a black H&M sweater and blue Topshop pants.